ArtSci Salon consists of a series of semi-informal gatherings facilitating discussion and cross-pollination between science, technology, and the arts. ArtSci Salon started in 2010 as a spin-off of Subtle Technologies Festival to satisfy increasing demands by the audience attending the Festival to have a more frequent (monthly or bi-monthly) outlet for debate and information sharing across disciplines. In addition, it responds to the recent expansion in the GTA area of a community of scientists and artists increasingly seeking collaborations across disciplines to successfully accomplish their research projects and questions. For more details, visit our blog. A project by ArtSci Salon. If you are scheduled to give a talk for this seminar series, please provide your talk title and abstract here. If you are attending a seminar, please register here. 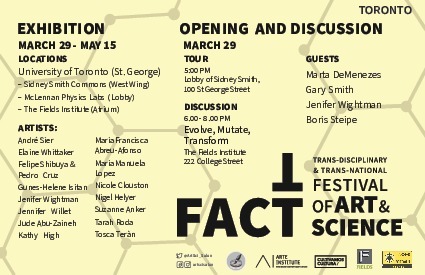 We are pleased to invite you to a series of events featuring interdisciplinary artist Heather Barnett and Physarum polycephalum: during her visit, Barnett will present her recent research, will conduct a workshop, and will explore the city of Toronto, inspired by the nonhuman perspective of this organism, also known as slime mould. Please see details in the schedule below.